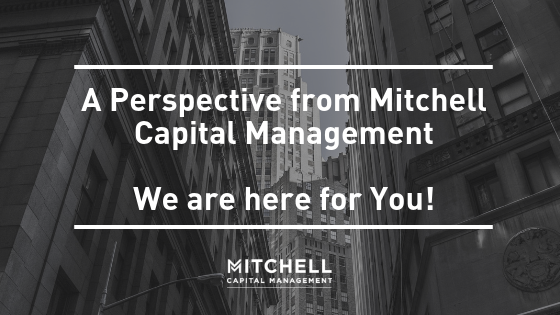 A Perspective from Mitchell Capital Management – We are Here for You! Home/Blog/A Perspective from Mitchell Capital Management – We are Here for You! As we have wrapped up the mid-term elections and a historic October for the financial markets, we felt the need to provide some thoughts to our most important asset – YOU. We are thankful for your trust and allowing us to assist in building your legacy. We are available for any questions/concerns/thoughts. The Federal Reserve – In early October, Fed Chairman Jerome Powell made comments around potentially raising rates into ‘restrictive’ territory, a possibility he did nothing to subsequently take back. Our fracturing relationship with China – Our trade complaints have brought geopolitical power issues to the surface, further clouding an already uncertain economic association. Market valuations, and specifically growth valuations, have been essentially reset to account for uncertainties the above bullet points as well as rising input costs potentially capping profit growth. Earnings growth was good during the 3rd Quarter, but the market has now discounted the likelihood of earnings growth continuing to be as strong heading into 2019. With the mid-term elections complete, what can we expect? Research focused on market returns around mid-term elections offers up the following observations. Markets usually bounce back strongly after elections. We have to wait and see, but consider the following. The Fed is forecasting future interest rate increases in a consistent and prudent manner that, and this is important, allows for opportunity to stop and pause as needed. Q3 earnings growth continues to be strong, representing success in growing organic revenues and the benefits of tax reform. Job growth continues, wages are rising, consumers are spending and the economy continues to expand at greater than 3%. Since 1950, the average one-year return following a mid-term election is 15%, more than double that of all other years during a similar period. We can’t promise that this time, but we have been taking advantage of the opportunities within the current markets. Stay the course, but this may also provide occasion to rebalance or reallocate your assets, as your circumstances dictate. Please let us know if you want to talk.